For other places with the same name, see Portsmouth (disambiguation). Portsmouth  (pronounced "ports-muth" and nicknamed "Pompey") is an island city in the county of Hampshire, on the south coast of England. Historically, Portsmouth has played a major role in British history, particularly as the home of the Royal Navy. The rich heritage in the city offers a variety of activities for the visitor, not least the Historic Dockyard which houses one of the most important collections of historic warships in the world. This includes HMS Victory, which was Lord Nelson's flagship used at the Battle of Trafalgar in 1805, and the Mary Rose, a Tudor-era warship. Boat tours of the harbour also allow ships of the modern navy to be observed. As an important military base for 2,000 years, the Portsmouth area contains fortifications from almost every era of British history. Aside from its rich Naval Heritage, Portsmouth is also known for its literary history as the birthplace of Charles Dickens, the famous Victorian era novelist. It is also the birthplace of pioneering engineer Isambard Kingdom Brunel. Other famous figures who have lived in Portsmouth include: HG Wells, Arthur Conan Doyle, Rudyard Kipling and Peter Sellers. Musically, the city is well served by three musical venues The Wedgewood Rooms, Guildhall and Pyramids which regularly host major musical and comedy acts. Portsmouth also has two cathedrals, including the Romanesque-style Portsmouth Cathedral , twelve museums, most of which are free, and two theatres offering plenty of other attractions to visit. The City also offers excellent shopping facilities located in the Gunwharf Quays complex, home to a variety of designer stores, including Ralph Lauren, Hugo Boss and Barbour, as well as the striking 557 ft landmark Spinnaker Tower which offers excellent views over the Solent and City. 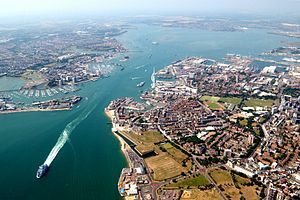 The majority of the city of Portsmouth lies on Portsea island (it is the only island city in the United Kingdom) on the southern coast of England. Historically, Portsmouth has always been an important naval port and builds on its rich heritage with memorials, museums, trails and the fascinating Historic Dockyard. Portsmouth has four miles of seafront (including pebbled beaches), two piers, a fun fair and the distinctive Spinnaker Tower. Portsmouth is also a university city, home to the University of Portsmouth and so has a large multicultural student population. Portsmouth has an approximate population of 190,200 people and is the most densely populated city in the UK, outside of certain parts of London. The surrounding Portsmouth Urban Area is home to more than 442,000 people. Portsmouth can be reached by train from London, by motorway from anywhere in England and by ferry from France and Spain. The nearest airport is Southampton Airport , around 20 mi from Portsmouth in Eastleigh. Over 47 European destinations are served from here. From the airport it is simple to get to Portsmouth by train, travelling from Southampton Airport Parkway and changing at either Southampton Central or Eastleigh. Portsmouth is on the National Rail network. Direct trains from London take about 90 minutes from London Waterloo, a cheap day single is about £21. Other major services include Brighton (1 h 40 min), Cardiff (3 h 10 min) via Bath and Bristol; and Southampton (1 hour). There are also direct trains from Gatwick Airport (1 h 20 min). Alight at Portsmouth Harbour for the Historic Dockyard, Gunwharf Quays, the Spinnaker Tower and Ferries to the Isle of Wight. Alight at Portsmouth & Southsea for Portsmouth City Centre shopping, Portsmouth Guildhall and a short walk to the seafront. Alight at Fratton for Fratton Park football stadium. Note that Hilsea station is situated to serve the industrial estates in the north-east of the city and is not a normal alighting point for most visitors and some trains do not stop there. Portsmouth is flat and very easy to get around, so taking public transport is recommended. For those wishing to depart via train those unfamiliar with Portsmouth's train stations will find it is easy to miss them even when only a few feet away. Portsmouth Harbour is behind the bus station at The Hard. Portsmouth & Southsea is easily found at the bottom of Commercial Road if you look out for the railway bridge just south of the building. Fratton can be found to the east of the road bridge at the bottom of Fratton Road and north of the roundabout between Victoria Road North and Goldsmith Avenue. The lesser frequented Hilsea Station is underneath the road bridge at Norway Road and Cosham station is on the Cosham High Street. Portsmouth is easily accessible by car via the M275 via the M27 and A27. From London, take the A3 or M3 south. As Portsmouth is an island city, routes in and out are limited, and so congestion can be a problem, especially during rush hour. Please note that Portsmouth has a citywide 20mph speed limit unless signposted otherwise. Parking is plentiful both on street (about £1/hr) and in pay-and-display car parks. The city centre and Gunwharf Quays both have multi-storey car parks, and Southsea has on-street parking. Check the signs carefully however - some carparks and onstreet parking apply charges 24 hours a day 7 days a week. Also note that some residential roads may have a time limit on parking without a residents permit and these restrictions apply 24 hours a day. If you stroll a little away from the city centre and tourist hot spots (sometimes just around the corner in Southsea), parking can be found for free or in time-limited bays. Motorcycles can park without a residents permit and within the marked bays. Gunwharf Quays also has a dedicated motorcycle bay in the underground car park. If you're visiting the University, you can obtain day car passes from University House. However, the car parks are very busy during term-time. Local bus routes stretch as far afield as Havant and Southampton. Day passes can be bought for £3.70 which allow you unlimited travel in the Portsmouth City area or £4.80 for the whole of Hampshire with First Buses (the major operator). National Express travels into the Hard (few hundred yards from harbour and historic dockyard) with links to many of the country's major cities. Megabus also operates from the Hard, offering longer distance services throughout the country. There are ferry services from four ports in France as well as Bilbao in Spain. There are also services to the Channel Islands of Jersey and Guernsey. The Isle of Wight is a under 60 min by ferry or a few minutes by hovercraft. The hovercraft is every 15 min from Southsea seafront, operated by Hovertravel . The ferry to Gosport (for Submarine and Explosion museums) runs every 7 minutes at peak times and every 15 min at other times until midnight for £2.20 return. Several bus companies operate within Portsmouth and the surrounding areas. A day travel ticket can be bought for £3.60 (£2.40 concessions). It is also possible to travel between the harbour and the city centre using the train. It is a compact, flat city however, and nowhere is a very long walk. At night, if you can find an elevated position you can navigate via the chain of blue lights along the sea-front, to the south. The Hard is the area around Portsmouth Historic Dockyard, Gunwharf Quays and Portsmouth Harbour Train and Bus Stations. Old Portsmouth/Sallyport/Spice Island, the area around the Anglican Cathedral Square and Round Tower, Camber Dock and along the sea walls. Southsea, the area next to the sea at the Southern end of the island and it stretches further north to include Southsea Town Centre (Palmerston, Elm, Marmion and Albert Roads). Commercial Road, the city centre, and the main shopping and market street, home of Cascades shopping mall. The main local minicab company is Aquacars with a fleet of over six hundred vehicles. There are also licensed taxis that can be found at taxi ranks at railway stations and busy areas and can be flagged down in the street. Portsmouth Historic Dockyard, . Located in the naval base, the Historic Dockyard has a number of historic ships including the HMS Victory and HMS Warrior 1860. In the Historic Dockyard is also Royal Naval Museum and Action Stations - an interactive look at the navy of today. There is a great old pub outside of Dockyard called the Ship Anson, worth a try. Portsmouth Visitor Information Centre can be found adjacent to the visitor entrance of the Dockyard. The Spinnaker Tower, Gunwharf Quays, Telephone: +44 23 9285 7520, . Open every day from 10AM-6PM (until 10PM on Saturdays and every day during Jul and Aug). This striking and highly-visible £21 million landmark tower rises some 170 m above the redeveloping harbour of Portsmouth, symbolising the wind filling a spinnaker sail. Visitors can use the tower to view from 3 levels: at 100 m, 105 m and 115 m. A high-speed internal lift takes you to the top. Admission adult £7.00, child £5.50, concessions £6.20. Southsea Castle, . Built in 1544, the Castle was part of a series of fortifications constructed by Henry VIII around England's coasts to protect the country from invaders. Close to Southsea Castle is the Australian Settlers Monument, which commemorates the sailing of the first European settlers from Portsmouth to Australia in 1787 . Southsea Seafront - 4 miles of seafront promenade backed by gorgeous green spaces and gardens. Royal Marines Museum, Southsea, Tel: +44 23 9281 9385 (Fax: +44 23 9283 8420 E-mail: [email protected]), . Open every day (except Dec. 23-25 and Boxing day) 10AM-5PM. Discover the exciting story of the Royal Marines brought to life with dramatic and interactive displays. The Museum is in what was one of the most stately Officers' Messes in England, built in the 1860s with beautiful ceilings, huge paintings and a grand staircase. Portsmouth's Cathedrals Portsmouth is home to two cathedrals, St Thomas' in Old Portsmouth (Anglican) and St John's in the City Centre (Catholic). D-Day Museum, . Open every day (except 24-26 Dec.) Apr-Oct 10AM-5.30PM; Nov-Mar 10AM-5PM. A fitting tribute to the sacrifice of the men & women who took part in the D-Day landings. Blue Reef Aquarium, Clarence Esplanade, Southsea, Tel +44 23 9287 5222, . Open every day except Christmas 10AM-5PM (Nov-Feb until 4PM). Take an undersea safari at the aquarium on the seafront. Charles Dickens Birthplace Museum, 393 Old Commercial Road, . Open every day from mid Apr-Dec 10AM-5:30PM. The famous writer Charles Dickens was born in this modest house in Portsmouth, England in 1812. City Museum & Records Office, . Home of the new Arthur Conan Doyle and Sherlock Holmes exhibition "A Study in Sherlock". Spitbank Fort, . Located in the middle of the Solent is this man-made fort, built to defend Portsmouth in the 1800's. Take a trip out for a party night or Sunday dinner. Royal Garrison Church, was constructed about 1212 as part of a hospital complex. The nave was badly damaged in a 1941 fire-bomb raid on Portsmouth and has remained as a roofless memorial ever since . Relax on Southsea Common with a picnic. Follow the Renaissance Trail around the Millennium Promenade, a self-guided walk with information along the way, just look out for the chain in the pavement. Alternatively, ask at the tourist office for information on guided walking tours. Take a boat tour around the historic harbour . Clarence Pier - A small fairground close to the Hoverport with rides and amusement arcades. South Parade Pier is currently undergoing refurbishment. Listen to live music at The Bandstand every Sunday in the summer. Watch Portsmouth F.C, play League 1 football at Fratton Park, a traditional stadium that oozes character. Albert Road is has a fair few student pubs, wine bars and cafe-bars, not to mention the numerous Indian restaurants. The lesser known but nicer area of Southsea is Palmerston Road - some bars and good restaurants. Guildhall Walk, where you will find bars such as The Astoria, Lyberry, Yates and Wetherspoons. Strictly for 18-30s. Prysm is also close to the Guildhall (just across from Portsmouth & Southsea station). The University of Portsmouth  is a modern university with a population of about 20,000 students. Portsmouth is also home to Highbury College . Portsmouth City Centre (Commercial Road & Cascades) - Usual high street names, but with Miss Selfridge, Topshop, H&M, New Look and Primark literally right next to one another, it is a shopping paradise. Gunwharf Quays - Outlet centre, with shops like M&S, Cadburys, Claire's, GAP. Some of the prices are cheaper than the high streets, but likewise some are similar or more expensive so shopping around is a good idea. Southsea Town Centre - A variety of small specialist shops, boutiques, art shops, delis, home furnishings. Also Debenhams and Knight & Lee. Albert Road - A good bet for smaller (independent) shops, second-hand goods and antiques. Fratton and North End - the main road running north to south through these areas is mostly lined with shops and businesses. Portsmouth has literally hundreds of restaurants catering to all tastes. Towards Fareham, the marina Port Solent offers a variety of restaurants in a pleasant environment with a multiplex movie theatre nearby, and ample (free) onsite parking. The American Bar, 58 White Hart Rd, Old Portsmouth, +44 23 9281 1585. Modern European cuisine. Also great but you can drop a lot of money in this place, which has great service! Kitsch N d'Or, 37 Eldon Street, Southsea, +44 23 9286 1519. French style bistro food. Great fixed price 2 course lunch, good value A La Carte evening menu and with monthly food-and-wine nights. Details are displayed outside the venue. Mozzarella Joes, Clarence Esplanade, Southsea, +44 23 9229 5004. A relatively new restaurant right on the pebbles, with the most amazing views of the Solent. Great for a cold glass of wine, stonebaked pizza and pasta. Regal House, 88 Albert Road, +44 23 9282 8382. Chinese Takeaway. Nemrut, 94 Albert Road, +44 23 9275 6777. Exceptional value & quality Turkish/Kurdish cuisine. The friendly owner & staff make the place one of the best places to eat out in Portsmouth. Runner Up in "The News" Best Restaurant 2006 for Portsmouth area. Rosie's Vineyard, 87 Elm Grove, Southsea, +44 23 9275 5944, . French/Modern European. Wonderful wine selection food and atmosphere. The Bombay Brasserie, Albert Road, +44 23 9282 1661. Very Popular Curry house that offers good value for money and that lets you bring your own drinks. Arrive early. Sur La Mer, 69 Palmerston Road, +44 23 9287 6678. French. Strada, Gunwharf Quays, +44 23 9281 7278, . Italian. The Tenth Hole Tea Room, (next to mini-golf course), +44 23 9283 0009. Great for light lunch but the highlight is the amazing home-made cakes. Best places for curry: Portsmouth offers a variety of Indian restaurants thanks to its prominent Asian community. The best places are Albert road where the curry are cheap as there is a restaurant literally every couple of shop, Palmerston road, where you pay for quality so take your pick. The Indian Ocean Takeaway, 234 Fratton Road, +44 23 9282 4720. Probably the longest serving curry outlet in Portsmouth, established in the early 1980's by the current owner/Chef Mr Mahtab Uddin. The quality of the food is of the highest quality and their curries are also priced very reasonably. As to be expected from an historic port town, and a current university city, there is an abundance of drinking establishments in Portsmouth, from traditional pubs to chic and trendy waterfront bars. The bars and clubs along Guildhall Walk are a popular spot, but a certain degree of vigilance is advised to ensure you have a fun and safe night out. The Fat Fox, Albert road. nice relaxed atmosphere, beer garden, traditional english pub menu. The Wine Vaults, Albert Road. Good cask ales and great atmosphere arrive early if you want a seat. Hole in the Wall, on or near Castle Road, off Elm Grove. Small pub with a 'traditional' feel, and real ales. Slug & Lettuce. Friendly and well priced contemporary bar on Palmerston Road. The Honest Politician, Elm Grove. A pub with pool tables and a relaxed atmosphere, and always a rocking soundtrack. The White Horse A pub with a relaxed atmosphere along Southsea Terrace. The Registry. A student pub near the Student Union with fairly cheap beer and food. Not a place for a quiet drink. The Deco, a pub popular with the alternative and student crowds. Good atmosphere but can be noisy and crowded on Friday and Saturday nights. DJ Sam Hatty on Wednesdays. The One Eyed Dog, a busy and popular pub with students, often with a DJ in the evenings. Can be noisy. The Old Customs House is a traditional pub in a historic building, within a modern setting. Great ales and food. Tiger Tiger is the ultimate place for a big night out - with 8 different bars, a club and restaurant in the same building! The Spice Island Inn also has amazing views of the harbour in action and a good restaurant. Hampshire Boulevard, 1 Hampshire Terrace, PO1 2QN. A very welcoming and lively bar. Open until 3am on Saturdays, and 2am the rest of the week. Accommodation in Portsmouth can be browsed online via the official VisitPortsmouth website  and the Visitor Info Centre can make bookings/check availability on your behalf: +44 23 9282 6722. Bed and Breakfast at No3, 3 Bellevue Terrace, Tel: +44 23 9234 9929. Located within walking distance of local attractions. Florence House Hotel and Somerset House Hotel, 2 Malvern Road, Tel: +44 23 9275 1666, . The city's only boutique accommodation just back from the seafront, these upmarket hotels are in easy reach of everything. Ibis Portsmouth Centre, Winston Churchill Avenue, Tel: +44 23 9264 0000, . Also good, near the Portsmouth & Southsea train station. Pembroke Park Hotel, 1 Bellevue Terrace, Southsea, Tel: +44 23 9229 6817. Located only minutes from the old town and the seafront, both Portsmouth & Southsea are within easy walking distance. Sandringham Hotel, Tel: +44 23 9287 6156,(email: [email protected]), . With views over the seafront common the excellent location offers great views at cheap rates. If you're on a budget and need a clean and comfortable room, look no further. Southsea Backpackers, 4 Florence Rd, in Southsea, Tel: +44 23 9283 2495, (email: [email protected]), . Not easy to get to but is cheap and friendly. Spitbank Fort, . The lighthouse has been refurbished and has accommodation. As with most other large English cities, there can be a problem with violence around the city centre at weekends, around pub and club closing times (around 11PM and 2AM), but with a little common sense, the risk is minor. The main place to avoid is Somerstown, the highrise council estate near the city centre, especially after dark. Buckland should also be avoided but as this is primarily a residential area in the north of the city the average visitor would not normally go there. Nothing should be left on display in vehicles and it's sensible to park your car in a Park Marque scheme facility (ask at the Visitor Info Centre +44 23 9282 6722). Due to football rivalry, wearing a Southampton football top may cause some problems in the city. In fact, anything with red and white vertical stripes (Southampton's colours) is probably a bad idea. Portchester Castle  - About 5 miles from Portsmouth is one of the best preserved Roman fortifications in Northern Europe. Views from the castle's keep, which was built in Norman times (largely from recycled Roman brick), cover much of the surrounding area. The outer wall is of the late Roman era. The original church is still in use and is popular in summer for weddings. The castle is well sign posted, and served by regular buses, Portchester rail station is only a 10 min walk north. The Cormorant Pub on picturesque Castle Street is a nice place to have a drink in a Traditional English pub. Portsdown Hill offers amazing views across Portsmouth and the South Downs. Just to the rear (north) of Portsmouth, it is a world away with countryside walks and traditional pubs . The Royal Armouries at Fort Nelson sits just on Portsdown Hill and is free of charge to visit. Gosport shares the harbour with Portsmouth and can be reached by a short ferry ride from by Portsmouth Harbour station. Home of Explosion, Museum of Naval Firepower and the Royal Naval Submarine Museum. Winchester, the former English capital is a beautiful city worth a visit. Excellent restaurants, interesting shops and of course the famous cathedral. Emsworth this small fishing town is a nice retreat year round, but the food festival in the first week of September is a real treat, not to be missed if you are in the area. New Forest and South Downs National Parks are amongst the nicest rural getaways in England. Isle of Wight England's largest island is a quick ferry or hovercraft ride across the Solent. Southampton is the traditional rival of Portsmouth, with an extensive shopping area and historical links to the Mayflower pilgrim fathers. Staunton Country Park this listed landscaped parkland and forest is 9 miles from Portsmouth. The Regency site includes an ornamental farm, ornamental lake, follies, a maze, walled garden and glasshouses. Hayling Island neighbours Portsmouth. It is a holiday, windsurfing and sailing centre, and the site where windsurfing was invented. West Wittering beach is highly popular on sunny summer days due to its long sandy beaches and south-facing position . Southwick is a picturesque village of 320 people situated 8 miles from Portsmouth. Its country pubs are a great place for a traditional Sunday roast. Arundel this market town is overlooked by a marvellous fairytale castle and surrounded by beautiful English countryside and riverside walks. Located less than 30 miles from Portsmouth, it is an ideal lunch stopover on a scenic drive back to London . Staunton Country Park, near Havant combines both a large parkland and lake (free), and an ornamental farm (paid admission). This page was last edited on 6 March 2019, at 15:38.